To say that I’m busy would be an understatement. This time of year is flat out crazy for me. If you follow me on Instagram you have seen a peek into my craziness. 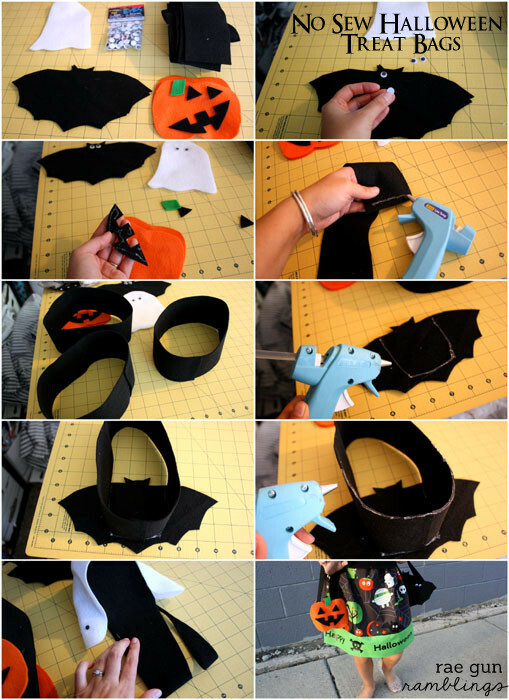 But I wanted to do a fun Halloween craft since usually I just have to watch everyone else part take in the festivities. Little did I know that the nieces would go gaga over this project. 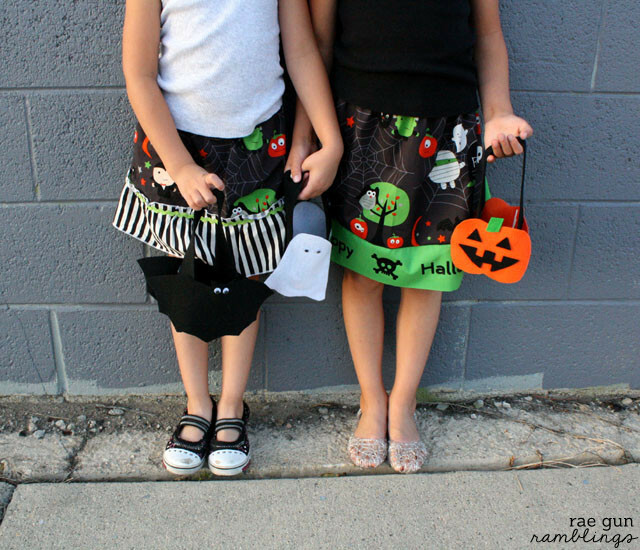 When I showed up with these simple goodie bags and special Halloween Skirts they were so smitten. My favorite part though is that they took just a few minutes to make and can be put together from really basic and inexpensive craft supplies that you can find at your favorite Jo-Ann Fabric and Craft store. Start by drawing your images. I made really basic shapes on scrap paper and then traced it onto the felt with a fabric marker. And the ghost was so basic that I just free handed that with scissors. Glue on the eyes and the face pieces. You want to cut strips of fabric that will be the body of the treat bag. Mine were 3 inches by 25 inches but you’ll want to base it on the size of your design pieces. It should be long enough to extend as a handle when positioned with your design pieces. Then overlap and glue the ends of each piece together to form a circle. Then with glue draw a U shape on the WRONG/inside side of your front design piece. Curve the strap circle so that it aligns with the glue and attaches. I like to use hot glue because it’s quick drying and strong. Now draw a line of glue on the edge of the strap piece just enough to attach the back piece. Attach the back piece. If you want a slimmer handle like I did fold it in have and with an angled cut slice off a little of the handle making sure not to cut the front or back piece. 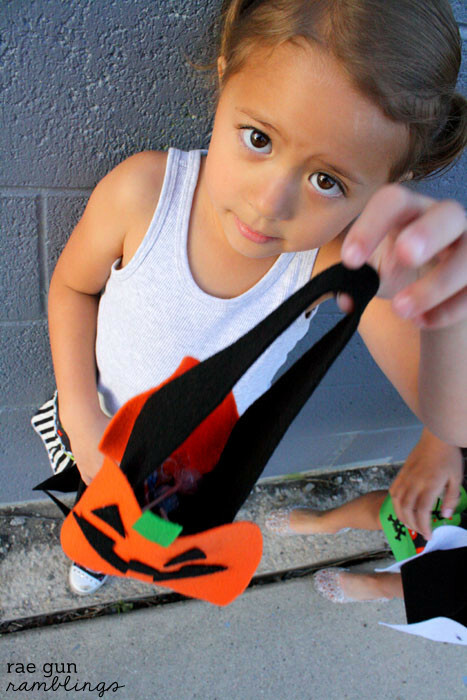 Fill with treats and hand to your favorite spooky friend! 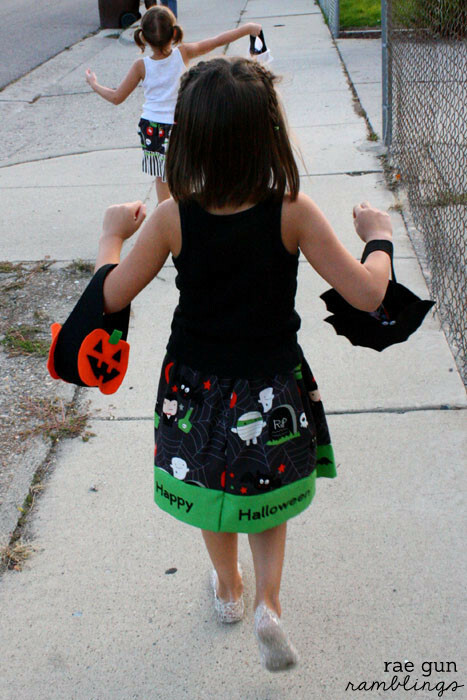 I can see them being really fun to put all kinds of treats, candy like we did, caramel apples, or even cupcakes. And really I was not joking when I said that the girls loved these bags! If you’re looking for costume tips don’t forget to check out my super gigantic list of tips, tricks, and inspiration for making awesome Halloween costumes without losing your mind! 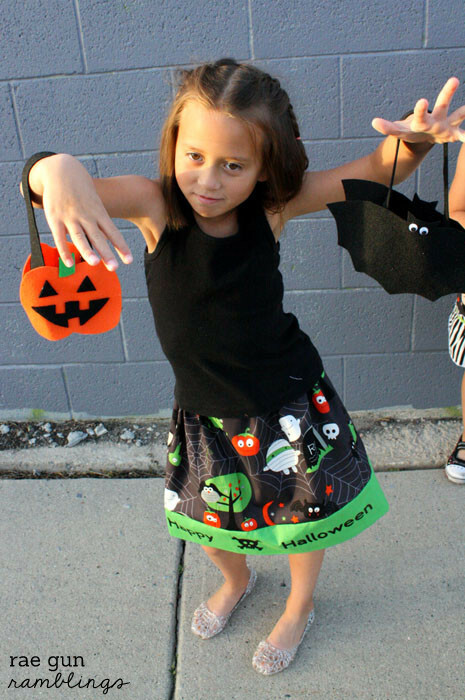 And learn how to make your own easy Halloween skirts! How adorable!!! By next Halloween I’ll have a little girl to make these for! :-) Thanks for the fun idea! Where is the tutorial on that adorable skirt!! those are so much fun and cute! They are so cute! My little girl would go gaga over them too! Sometime simple really is better! Ok, these are too cute. I think we are going to make them next week as a project for Dax and his friend. Thanks for the coupon! So Cute – this is a project my daughter would love to do with me. 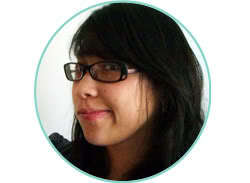 Hi Marissa…the minute I read No Sew I was here! I just can’t sew to save my own sorry behind, lol! 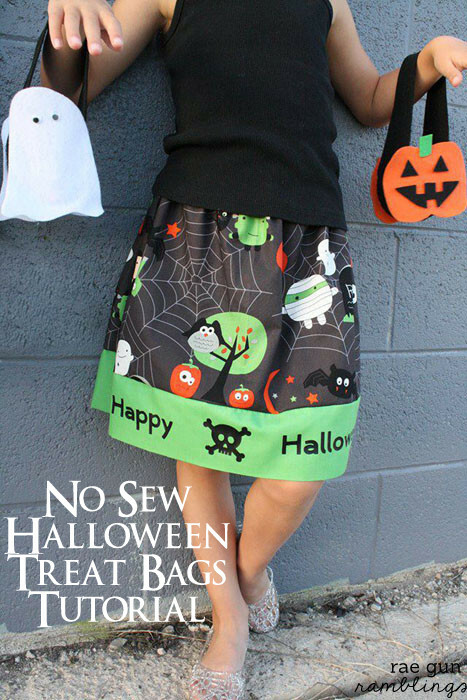 These are super cute and again No Sew which makes them even better. The girls seem to like them a lot too! Thanks for the coupon 50% off its awesome. I love these treat bags! You are talking my language with “no sew”. That skirt is darling too. I hope you will come by Made for Kids and link this up. Super cute idea. BUT, let’s talk about those skirts!! How fun. The little bag just completes the whole look. How cute! I love the pics and this would be a lot of fun to make with the kids. Thankyou for sharing on #HomeMattersParty! Wow! such an amazing piece of work! Really loved it and so easy to make, thank you very much!